Tessa Longbons | December 19, 2017. Alaska’s annual abortion report for 2016, published in February 2017 on the state’s Department of Public Health website, reveals that abortions are down by almost six percent from the previous year. The 17-page report provides a concise summary of abortion trends in the state. *Information on Alaska’s abortion rate and Planned Parenthood’s Alaska market share is not publicly available. In 2016, a total of 1,260 abortions were reported in Alaska, a decrease from the 1,334 abortions reported in 2015. Since 2003, the earliest reporting year available, abortions in Alaska have declined by over 30 percent. Chemical abortions have also fallen, dropping by three-and-a-half percent from 2015 and by not quite two percent from 2003. 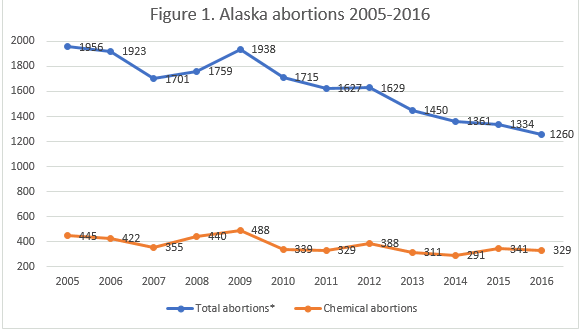 However, during 2016, the 329 chemical abortions performed in Alaska made up 26 percent of total abortions, while in 2003 chemical abortions composed only 19 percent of total abortions. Alaska reports whether chemical abortions were induced by methotrexate or mifepristone (RU-486); in 2016, only mifepristone was used. Alaska has calculated abortion rates only for the years 2003, 2004, and 2005. In 2016, almost 99 percent of reported abortions in Alaska were performed on state residents. Women in their twenties made up the largest age group at 57 percent. Alaska’s law requiring parental notification before a minor can procure an abortion has been permanently blocked by a court order, and 151 girls age 19 or younger underwent abortions. White women composed the largest racial group at 62 percent of abortions, followed by Alaskan Native/American Indian women at 18 percent. Black women made up only eight percent of women seeking abortions. Forty-one percent of women reported that they had completed 12 years of education, and 42 percent had completed 13 or more years of education. Seventy-nine percent of abortions were performed on women who were unmarried. Forty-two percent of women had never given birth, and 66 percent reported no prior abortions. The majority of abortions, 65 percent, were performed at five to eight weeks gestation, with an additional 28 percent performed at nine to 12 weeks. No abortions were reported after 20 weeks of gestation. In 2017, the Alaska medical board changed regulations regarding abortions after 12 weeks following a lawsuit by Planned Parenthood of the Great Northwest and the Hawaiian Islands. The board discarded previous rules that required riskier second-trimester abortion procedures to be conducted in a surgically-equipped setting with the consultation of a second physician. Alaska requires that women give informed consent before undergoing abortions and maintains a website with facts about abortion and other options available to women. In 2016, some 25 percent of women undergoing abortions received a hard copy of the information available online. The 2016 report states that three abortions were performed because the babies had congenital anomalies. Alaska does not report the date of abortions, and it does not collect or report information on complications resulting from abortion. Alaska is one of 17 states that provide Medicaid coverage for abortions that are deemed “medically necessary” and is one of only six states to report how abortions are paid for. In 2013, the Alaska legislature tried to create a narrow definition of “medically necessary” abortion, but the law was struck down by a court decision that permits doctors broad discretion in determining whether abortions are “necessary.” In 2016, a total of 556 abortions, or 44 percent of the state total, were paid for with Medicaid. However, only 33 percent of abortions were covered by Medicaid in 2015, and only 32 percent in 2014. Alaska expanded Medicaid coverage in 2015, which the Charlotte Lozier Institute predicted would increase the number of publicly-funded abortions. Alaska’s abortion reporting has not always thoroughly captured the different forms of payment used for abortion. Only two abortions in 2016 were paid for using methods that were categorized as “other/not stated.” In 2012, though, nearly half of abortions fell into this category. Alaska has increased the precision of its payment reporting over the past few years. In a study on state abortion reporting published by the Charlotte Lozier Institute in 2016, Alaska tied with West Virginia for 21st best out of the 50 states, New York City, and the District of Columbia. While Alaska’s report provides a basic overview of abortion in the state, Alaska could improve its reporting by including information on complications resulting from abortion and women’s reasons for choosing abortion. The state could also collect information on the babies killed by abortion, such as their weight or whether any babies were viable. Additionally, Alaska could clarify the cut-off date for the inclusion of individual abortion reporting forms in the annual report. Alaska’s 2016 and 2015 reports are based on data from forms received by February 2 of the following year, but the 2014 report used forms received by March 5 and the 2013 report used forms received by February 18. More consistent cut-off dates would make data more comparable from year to year. Alaska is one of the first states to release its report each year. Tessa Longbons is a research associate with the Charlotte Lozier Institute.